Allium is a large genus of perennial flowering plants grown from underground bulbs. Related to the Amaryllis, alliums are grown widely for their bulbs and stalks, better known as onions, leeks and chives. The flowers on some alliums are very large and widely sought after by gardeners and florists. 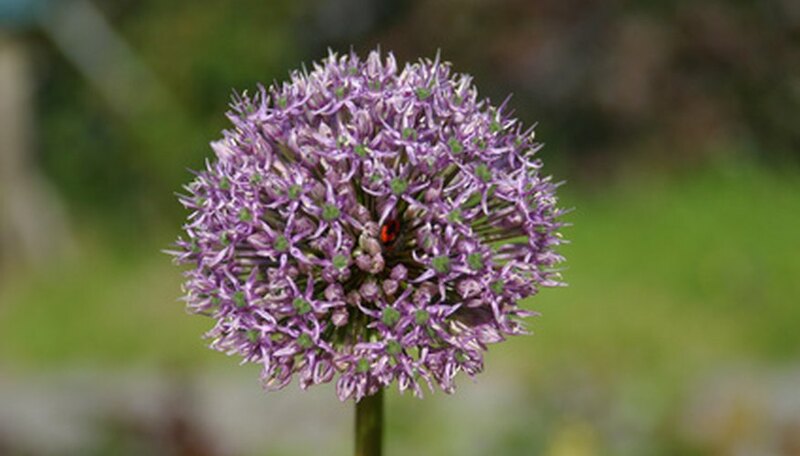 The Allium Globemaster, for example, has perfectly round, purple flower heads 6 inches in diameter. Alliums are prone to several common diseases, both when growing in the ground and during shipping and long-term storage. Caused by the fungi Botrytis squamosa, Botrytis leaf blight, also commonly known as blast, is a common disease of allium. It produces small white splotches along the top leaf surface. The disease is frequently associated with small whitish spots surrounded by green rings that look waterlogged or oily. These spots will cause leaf die-back. Pruning and treatment with a spray fungicide will keep the spores from spreading more widely and hold the infection in check. Known as the fungus Alternaria porri, purple blotch infects allium leaves, seeds, flower stalks and bulbs. Symptoms become visible with tiny white sunken wounds with purple-dotted eyes on the leaf surfaces. The round wounds expand over the leaf surface as the infection grows and turn dark purple. Alliums can contract purple blotch throughout the mature and harvest phases of the life cycle. The disease is activated by moisture left on the plant leaves for any period of 10 to 12 hours. If the spores are present, an infection will form. Limiting exposure to moisture and treatment with fungicide sprays when wet conditions are predicted help to squelch fungal activity. Brought on by the bacteria Erwinia carotovora, bacterial soft rot is very common in alliums being held in storage. The bacteria accesses the allium tissues through the bulb neck as the plant becomes mature. It infects and rots certain scales or layers of the allium bulb flesh and emits a foul odor. Compromised onions damaged by processing equipment, sun scald or dings and bruises, or humid and warm conditions all invite soft rot. Prevention requires cool, dry storage conditions with fresh air flow, careful handling and removal of weak or damaged alliums from the area.